::voice from inside box:: - UM HEY!!!! what are you doing out there??? Can I haf some more ham??? ::voice from inside box:: - UM THANKS!! Try not to get it on mine head next time. I hope he gets there alright. You really are a very naughty boy, SAMMY!!!! We are coming right over to rescue Miles. heeheeeheeeeehe is Miles on his way for a bisit to Missouri?? 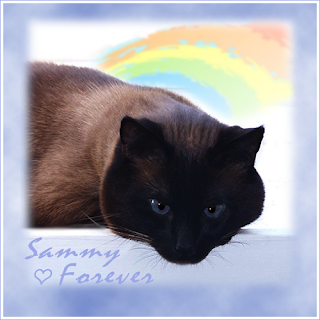 Sammy, you do realize that Miles will be treated like a king with the Meowzers right? Excellent job, Sammy! With such good directions, it should only take about twenty elebeny minutes to get to the Meowers. We hope Miles loves his new home, er, we mean visiting. Oh noes, Miles is being sent away. AGAIN! He'll get there ok unless someone opens it along the way and he ends up in Philly! Uh oh. If Miles is going all the way to Missouri, you better put some extra ham in there, Sammy! Can we ship Teddy to Missouri? He's been a bad boy!